Fill a rocks glass with ice. Add the blue Curaçao and coconut rum. Using the back of a bar spoon, float a thin layer of pineapple juice on top. 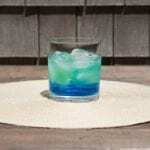 Just like Lake Erie itself, this drink is yellowish-green on top and blue down below.